Midwinter may seem an odd time to think back to midsummer, but 2005 was another extraordinary fire year in Alaska, and the stats are in. Michael Richmond of the National Weather Service office in Fairbanks wrote a recent review of the 2005 fire year, during which Alaska lost more acreage to fire than it had in all but two of the preceding 50 years (detailed Alaska fire records only go back to 1956). Richmond is the Fire Weather Program Manager for the Fairbanks office. An area of Alaska larger than Connecticut and Rhode Island burned in 2005, this after a chunk of acreage burned in 2004 that equaled the size of Vermont. The 4.5 million acres in 2005 was dwarfed only by the 6.7 million acres last year and the 5 million acres that burned in 1957.
this because of two severe fire years back to back. Photo of Cripple Creek drainage by Ned Rozell. Weatherwise, why did so much of Alaska burn again in 2005? The snowfall levels over the winter in the Interior were close to average, which might make one assume there was plenty of spring moisture to prevent early fires. However, Richmond countered this by citing Alaska Fire Service Fire Management Specialist Mike Butteri's analysis of Interior snowpack and large fire growth, where Butteri suggests there is no correlation between the two. A more important factor in 2005 was a hot May in the Interior, with monthly average temperatures 4-to-7 degrees Fahrenheit warmer throughout the region that extends from the Alaska Range to the Brooks Range. Fairbanks, smack in the middle, recorded its warmest May in the entire 101 years of temperature records here (The average temperature was 55.6 degrees). A warm and dry June followed, with average temperatures from 2 to as much as 10 degrees warmer than normal. Thunderstorms cranked up in June, with a tremendous amount of lighting strikes (Alaska's primary wildfire starter). On June 15, 2005, the Alaska lightning detection system recorded 11,163 strikes, shattering the previous record of 9,022 set on July 15, 2004. 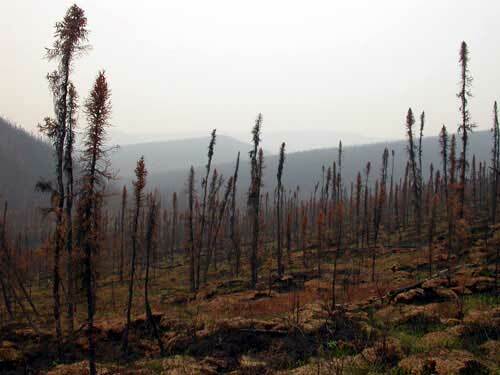 More than 1 million acres of Alaska had burned by the end of June 2005. July was a relatively wet month in the Interior (the town of Northway recorded 6.36 inches of rain during the month; its monthly average was 2.30), and another 500,000 acres burned then. With August historically the wettest month in the Interior, smoke-breathers in Alaska towns looked forward to drenching rains that would put out fires, or at least slow the season down. But it sped up. August in 2005 was the second August in a row to become the driest on record in the Interior. Just 0.24 inches of rain fell in Fairbanks for the month, the lowest amount ever recorded. This followed a freaky August 2004, when only 0.34 inches of rain fell. During the dry August, meteorologists recorded another superlative event, the strongest high-pressure ridge ever measured over the central Interior. The strength of the high-pressure ridge topped the next-strongest one, recorded on June 15, 1969, when Fairbanks recorded its all-time high of 96 degrees Fahrenheit. Temperatures in Fairbanks in August 2005 would have been much higher if not for the thick smoke that poured into the city, reminding people of the woeful summer of 2004. From August 8 to August 18, three million more acres of Alaska burned. By the end of the month, 4.4 million acres of Alaska forest and tundra had vaporized. The fire season cooled off in September, but the summer ranked as the sixth warmest in the Interior since 1918, with an average temperature of 59.2 degrees, down from 2004's all-time record of 61.4 degrees for May through August. In the last two years, more than 10 percent of the Interior has burned, including my two favorite public-use cabins in the White Mountains National Recreation Area. Fire managers and meteorologists wonder what the summer of 2006 will bring. "At this rate, one has to wonder, how long can this keep up before most of the burnable acreage in Interior Alaska runs out?" Richmond wrote. This column is provided as a public service by the Geophysical Institute, University of Alaska Fairbanks, in cooperation with the UAF research community. Ned Rozell [nrozell[AT]gi.alaska.edu] is a science writer at the institute.